The vehicle involved in the rollover accident on County Farm Road. 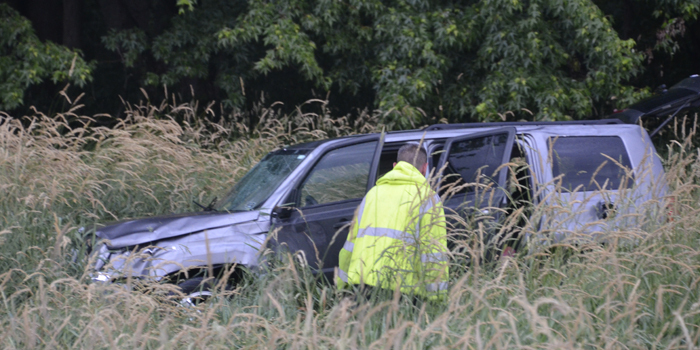 CLAYPOOL — At approximately 6:45 p.m. Tuesday, June 20, Claypool Fire Department and Lutheran EMS were called regarding report of a vehicle rollover in the 7200 block of County Farm Road, just north of the railroad tracks. 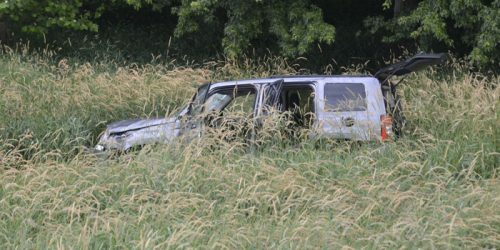 An SUV left the road and rolled over, ending up in a ditch. Information received on scene is that the driver and passenger were both teenage females and that no one was transported. Kosciusko Sheriff’s Department was also on scene. Emergency personnel investigate scene of a rollover on County Farm Road.